The first time I traveled to Melbourne, Australia was back in 1998 as part of a student exchange program during my university years. And during the 6 months that I spent here ‘studying’, as well as dying my hair bright blue and having my eyebrows pierced, I fell in love with this city more than I ever imagined I would. Perhaps it was due to the simple fact that Melbourne was the first foreign destination that I had visited on my own, but whatever the reason, as I boarded my return flight to the US at the end of the semester, I knew that it would not be long before I revisited this city and this country. I know that a lot of people say such things about places they visit. “I’ll be back soon” or “I’ll return one day” are common phrases for travelers to utter moments before they leave a country. I’ve uttered those very words countless times as well, and just like most people, I have not returned to most of those places. However, when it comes to Australia, and Melbourne in particular, I did return. As I write this, I am actually in the midst of my fifth trip to this city since 1998, partly due to the fact that I’ve managed to find inexpensive flights to Australia at times over the years. To me, Melbourne is one of those destinations where, no matter how many times I visit, I am always as excited to be here as I was the first time. This would help explain why I’ve now spent more time in Melbourne over the past 12 years – some 20 months in total – than I have in my home city of Boston during that period of time. I will forever maintain a strong bond with Melbourne because of the education it offered me during that one semester abroad. However, I’m not talking about what I learned in the classroom or on the university campus at all. While I often mention that first “3-month backpacking adventure to Southeast Asia that has now turned into 11 years of travel”, I would actually never have even taken that trip had Melbourne never come into my life. During my semester here, I found myself suddenly exposed to a wealth of new ideas, one of those being backpacking, an entire form of travel that, truthfully, I knew nothing about at the time. Combine this discovery that people of all ages were strapping backpacks to their backs and traveling the world on tight budgets, with the heavy Asian influence in Melbourne, much of which derived from cultures I again, knew nothing about, and the seed of my wandering lifestyle was unknowingly planted. So, here I am back in Melbourne and of course, I am not here this time to study at university or to dye my hair blue for that matter. So why am I here? Why did I board a flight for the several thousand mile journey to this city, just as I’ve done every 2-3 years since 1998? 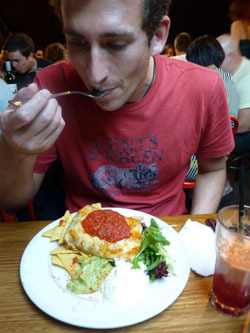 I’ll never forget my first visit when I couldn’t believe the incredible diversity of food available in this city. From Tibetan to Afghani to Ethiopian to Nepalese and Lebanese, I wanted to try it all and most of the time, I loved what I tried. Now, each time I visit Melbourne, I typically spend the first few days visiting all of my favorite eating establishments. I happily slurp up huge bowls of Vietnamese noodle soup at Mekong (Swanston Street), dig into flavorful thalis at Flora Indian Restaurant (Flinders Street), wait an hour for a table at the Vegie Bar (Brunswick Street) for the chance to bite into any of their creative vegetarian dishes, take my time eating the perfect falafel sandwich at Half Moon Cafe (Sydney Road) and giggle in disbelief as I cover my aromatic rice with scoops of insanely delicious coconut-based curries served up at Thaila Thai (Lygon Street). Despite Australia’s notoriously poor internet connections (sorry Australians, it’s not the best), the State Library of Victoria in the heart of the city has proven to be my savior during my last few visits. Basically, it’s a free office for me to use and I love walking up the steps each morning, wandering across the large halls and finding a hidden work desk or comfy chair to settle into for a few hours. With the most reliable internet connection in the city, as well as a variety of quiet, bright rooms that each offer their own unique atmosphere, I accomplish more work during the hours I spend inside of this library than when I am working anywhere else on the planet. Knowing that I can come to the library and efficiently check things off of my never-ending list of work to be completed is something I look forward to with every visit. Of course, once the work is over, I’m ready to wander outside and enjoy the Melbourne summer as much as possible (except on those cold summer days that appear with more regularity than I would like to see). Luckily, I never have to walk far to find something interesting. From tiny cafe-filled alleys improbably wedged between tall office buildings, the Southbank Promenade along the Yarra River, the endless paths through the expansive and impressive Royal Botanical Gardens and the abundance of open-air markets to get lost in, there is no shortage of places to explore by foot. Often times I’ll simply jump on a tram and ride out to the edge of the city, where I can spend hours strolling through the beach community of St. Kilda, in and out of the second-hand shops, beer gardens and Middle Eastern restaurants of Sydney Road or the Vietnamese cafes and bakeries on Victoria Street. Without a doubt, one of the main reasons I return time and time again to this city is the great group of friends I have that live here. Many of these friends are people I first met during my studies and with whom I’ve stayed in close contact, while others are people I’ve met during subsequent visits or Australian travelers I met overseas during my adventures. The result is that I now have a larger community of friends here in Melbourne than I do in any other part of the world, including anywhere in the US. And having such a network of good people to spend time with is not too common for someone who spends most of the year, every year, out on the road. So yes, even a permanent nomad finds comfort in such a strong community of friends. In fact, I derive so much enjoyment from the interactions and gatherings that result, that I am willing to travel halfway across the world every few years in order to experience it. And this is the very reason I have now realized that Melbourne is no longer merely a travel destination to me, but more of a ‘home’ instead. I agree and disagree. I tend to have a bit of a love/hate relationship with Melbourne. Its a nice place but I have found it is boring! Maybe we aren’t looking in the right places or we have travelled there far too often (being so cheap to fly between Adelaide and Melb). I’m considering starting a Ph.D in Tasmania next year, rather than staying in Canada. I think it will be a good opportunity to visit Australia & New Zealand (and parts of Asia) over 3-4 years. Have you been to Tasmania? …I should add that I’m terrified of spiders, and Australia has some huge ones! Hey Melissa – Oddly enough, despite having been to Australia five or six times, Tasmania is the only state I have yet to visit 🙂 And I wouldn’t worry too much about the spiders, it’s not as if they’re walking around the cities or present everywhere you go! Melbourne is one of the top cities in my list of the places I would love to visit. I am a huge fan of cricket. So watching a Boxing Day Test Match is on my bucket list. Hey Vishal – I’m a cricket fan as well and while I haven’t seen a Boxing Day Test Match, every match I’ve gone to at the MCG has been quite memorable! Hi Earl, glad to have you as an honourary Melburnian. The internet is pretty poor so hopefully the “National Broadband Network” will the cure. I love Melbourne! Being from Adelaide, heading each year back to University is a delight to the senses. There is so much to learn, and so many ways to truly live. The amount of tourists we have visiting – backpackers, students, tourists or even other Australians – make Melbourne such a fun, culturally aware city. Hey Nicole – Thank you for the comment! And I was actually just reading an article about how by the time Australia catches up with their internet they will most likely be behind once again. Hopefully that will get sorted out soon. Melbourne is fab! It’s a lot like Sydney but without the harbour and beaches being such a feature. Our internet speeds are not great but it’s getting better! It’s got a funky bar scene, too, I think. And great stuff for kids. They market it as the world’s most livable city, and, if you’re earning Aussie dollars, I can see why so many people would feel at home there. It’s also by far Australia’s most cosmopolitan city, and home to a swathe of my son’s family. Hey Theodora – There is indeed a funky bar scene here with so many small and quirky pubs everywhere you turn. Unfortunately, Melbourne lost it’s “most livable city” label due to some recent crime issues, but there are still few places on the planet as livable as this one! Have you been to Biero yet? Amazing beers. Okay, now I just have to get myself to Melbourne! Hey Dave and Deb – I have no doubt that you two will make it here at some point in your adventures! Well hello my fellow Melbournite. I had no idea, you had spent that amount of time here. I’m born and bred, and love my home town. To be a true Melbournite, you must declare what fotty team you barrack for Earl. If your in town for a while, I wouln’t mind catching up with you for a chat. Take it easy mate. Sorry that should be footy team. I have heard that this is one the best places to go in Australia.. and others have told me that Australia is an incredible place to be. Once I head to Asia I def plan on living in Melbourne first! Cant wait! 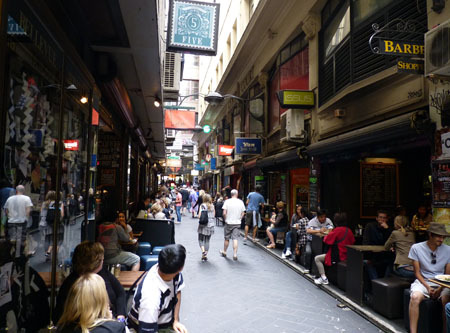 @WanderingTrader: Melbourne is absolutely worth a visit! The good thing is that it isn’t too far (relatively speaking) from Asia so it’s well worth the side trip. And if you have a look at some of the budget airlines such as AirAsia and Jetstar, you can normally find ridiculously cheap fares from Asia to Australia. Great to read an article from someone else who has adopted Melbourne as their home (at least some of the time!). Hi Earl, I’m getting hungry just reading this. Now I’m nowhere near delicious Thai food. 🙁 Melbourne sounds very cool! I promised my friend I would visit him in Perth one day but it sounds like I need a side trip to Melbourne. Ahh Earl, I share the same love for this city! So much so I’m actually returning to Melbourne at the end of February for a quick weekend getaway simply to enjoy the culinary delights of this beautiful city. If you’re interested in more fine dining, you simply CANNOT go past Nobu inside the Crown Casino arcade – easily the best meal I’ve ever had in my life, and that’s not only to do with the taste of the food but also the level of service. 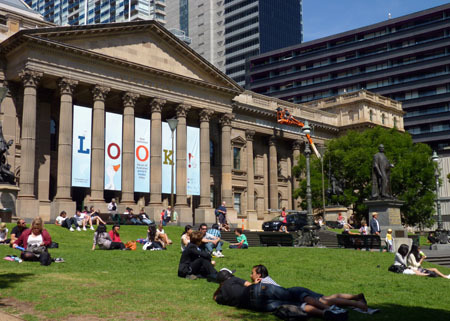 Melbourne has a great ambience when it comes to culture here! As much as it hurts me to say it, Sydney may have a bigger melting pot of cultures, but Melbourne thrives far better in this. Happy to share much more recommended places if you wanna flick me off an email! Oh and I’m even weighing up moving down to Melbourne once my studies are over to properly explore the place! Well worth the 10 hour drive from Sydney! Hey Kan – Sorry, I replied to your other comment before reading this one. I actually have eaten at Nobu two years ago and agree with you that it’s as good as it gets. And I think the cultural diversity of Melbourne may be more intense than in Sydney because it is on such a smaller scale. That’s also one of the main reasons I love this place as it doesn’t matter what street you walk down, you’re surrounded by such diversity all the time! It looks like an awesome city and I certainly would love to visit one day. Don’t you just love reliable libraries! Will be sad if they ever die out. Hey Forest – The death of libraries will be a sad day. This one is such a gem and it is always packed, which is a good sign. Every day there are hundreds of people inside, studying, working, reading….it’s such a great atmosphere that is unfortunately rare these days! What a great review of my city! So nice to hear that you feel so at home here. You’re welcome back any time! Sounds great! We haven’t been yet but I love the sound of the diversity of food and working in the library. My only concern is that I’ve heard it’s expensive. Enjoy yourself! I would say that Melbourne is quite cheap if you know where to look in terms of your everyday expenses! It’s definitely a city well worth exploring! Hey Kan – This city can be cheap once you get the hang of it although it has become much more expensive lately. And it doesn’t help me that the US dollar has dropped in value either. But there are some hidden places to eat and plenty of free events to keep one entertained, something I’ve always enjoyed about Melbourne! Hey Erin – Before this trip, I would have said (actually, I have said) that Melbourne is quite an inexpensive place to live. However, in the last two years since my previous visit, things have changed, especially now that the US dollar is even with the Aussie dollar. So it is expensive right now unfortunately. I think I’m spending more money here than I did during my last month long visit to NYC! I have the same passion for Melbs as you do! I will return over and over and over again. Can I pleeeeease see a pic of you with blue hair??? Hey Andi – I don’t seem to have a photo of me with blue hair on my laptop. I must have failed to transfer them when I bought this computer 🙂 However, I just sent an email to a friend here in Melbourne that might have one so I’ll be sure to put it up if she does! Great post as usual, Earl. But my main concern is seeing a photo of the blue hair… Does such a thing even exist? Welcome back D – look forward to catching up soon. Hey Si – Welcome to Melbourne! Can’t wait to catch up as well and I shall be in touch later on today! I wasn’t aware about the internet problems though, that is surprising. Hey Andrew – You should definitely take advantage of that working holiday visa. I’ve always been jealous of those who had that option as Americans weren’t allowed to apply for one until recently (and after I had already passed the age limit). And the internet is surprising and a bit frustrating at times. But if you get set up in a proper flat or house and sign up for a contract with one of the major providers, you’ll manage to have quite decent internet in the end. It’s worse for those who must rely on the internet of friend’s who chose not to pay/don’t need a fast connection or on public free wi-fi spots, which I am currently doing! Aaw, those are the exact reasons we love San Francisco. SF will always be one of the places we call ‘home’. Hey Jill – It’s good to know that you have your home in SF! Whenever we feel a unique connection to a place, especially when we spend so much time traveling, it can be so rewarding to find a city where we feel so comfortable. Sounds great! I’ve never been there, but I’ve heard a lot of wonderful things about it. I also love how the Aussies travel–the fact that so many do–and the ones I’ve met have been super cool. I can see how the nomadic seeds were planted when you were there originally. Enjoy your trip and that 2nd ‘home’! Hey Lisa – I also think it’s great how much Aussies seem to travel. When I first heard the term “OE” (overseas experience) used here, I was blown away that it was actually acceptable, and even expected, for many people here to take a 1 year OE. I personally think that’s a great attitude for a country to have towards travel! This post made me so happy! Replace “Melbourne” with Sydney and “1998” with 2009 and the first paragraph could be about me! Of course, I haven’t been traveling for 12 years either but you know what I mean! Studying in Sydney changed my life and opened my eyes to all that the world has to offer. I’m so glad that you’ve found a home in Melbourne! I hope you enjoy you time there and I hope that when I come back to Australia I can spend more time in Melbourne discovering all the things that you have mentioned. We only got to be there for 6 days so there is still so much to discover! I hope you get a chance to return here soon! We just finished a four year stint living in Melbourne and I think you’ve hit on some it’s best points here. I also enjoyed how busy the city was, with heaps of festivals and sporting events on all the time. There is always something to do! Hey Andrea – Spending four years here must have been amazing! You surely would have developed quite a deep connection with this city during that period of time. And there really is always something going on in Melbourne, most notably the free festivals that take place all over the city during the summer. There seems to be a place to go for great food and music every single night! @iamthewitch: I couldn’t agree more and rarely do I meet anyone who didn’t fall in love with this city. And thanks for mentioning the vineyards…it reminds me I should to take a trip out to the Yarra Valley before I leave! It is so wonderful to hear that Melbourne is a home for you. It is a fantastic city, and I really want to spend more time exploring it. It would have to be Australia’s best cultural city. The food is divine. Don’t worry about complaining about the internet. I complain about it every day. For a first world country, I think it is really poor. I hope they do something about it. The library sounds like the perfect place to work. I am going to remember that one. Hey Caz – This is definitely one of the most culturally interesting cities on the planet. Given its small size, even a visitor ends up being exposed to every culture that calls this city home, many of which we would barely notice in other diverse cities such as NYC. And I do feel much better knowing that Australians are complaining about the internet as well!